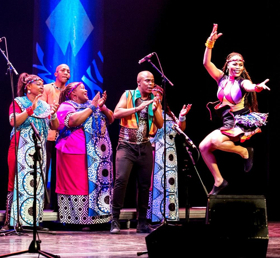 On Sunday, November 2018 at 5 PM, the two-time GRAMMY Award-winning Soweto Gospel Choir will headline at the Capitol Centre for the Arts in Downtown Concord, NH. The performance will be part of the free 2018-19 William H. Gile Concert series. Soweto Choir which comprises 20 of the finest artists in South Africa has been spreading joy to audiences around the world for almost two decades now. The choir invites audiences to enjoy the unique and inspiring power of African Gospel music. These energetic performers have shared the stage with some of the biggest names in music including U2, Aretha Franklin, Stevie Wonder, Robert Plant, Celine Dion, Red Hot Chili Peppers, and Josh Groban. Tickets for the November 25 Soweto Gospel Choir performance are limited to four per patron and are available starting Monday, October 22 at 11 AM. They may be ordered by calling the Capitol Center for the Arts at (603) 225-1111 or online at ccanh.com. Tickets may also be obtained at the Center’s box office at 44 South Main St., Concord, NH, which is open Monday, Tuesday, Thursday and Friday from 11 AM to 6 PM. The William H. Gile Concert Series opened on December 16, 1960, after a legacy of more than $700,000 was left by Helen B. Gile in 1952 to finance a free concert series for the residents of Concord, New Hampshire. The bequest was made in memory of Ms. Gile’s father, William H. Gile, who had resided in Concord for a number of years. Ms. Giles stipulated that the details of the concerts were to be left to a committee of three Concord citizens and that the events were to be “of the highest type in all respects.” After much consultation, the first Gile Concert Series was arranged for the 1960-61 season and was held at the Capitol Theatre (now the Capitol Center for the Arts). Over the first few years alone, the Gile Series enabled the Concord community to enjoy choir, dance group, and operatic performances, as well as luminary soloists such as Van Cliburn, Isaac Stern, Duke Ellington, Count Basie, and Victor Borge. While the concert series has been held at various locations over the decades, it is currently being performed again at the Capitol Center. Previous Gile Series performances have included the State Ballet Theatre of Russia’s Cinderella, Drumline Live, Gobsmacked, Cashore Marionettes, Tom Rush, The Summer of Love, and Veronica Swift. Other upcoming Gile Series performances include Dorrance Dance (January 15, 2019), Mnozil Brass (February 7, 2019), and the U.S. Army Field Band (March 26, 2019). The award-winning Capitol Center for the Arts (ccanh.com) inspires, educates, and entertains audiences by providing a quality venue for the performing arts as well as a wide range of professional-level, artistically-significant presentations. The Center is conveniently located off Rt. 93 in downtown Concord, New Hampshire and is close to several quality restaurants, shopping boutiques, and other area attractions. The facility first opened in 1927 as the Capitol Theatre, a prime stop on the Vaudeville circuit; it later became Concord’s premier movie house and concert hall. After closing in 1989, it underwent a multi-million dollar renovation/modernization and reopened in 1995 as the Capitol Center for the Arts. Today, the Capitol Center is home to the 1304-seat Chubb Theatre, the Spotlight Café, The Governor’s Hall ballroom, and the Kimball House, a Victorian mansion. Its newest venue, the Bank of New Hampshire Stage at 14-16 S Main St, is scheduled to open in Spring 2019. Altar of Praise Releases New Music Video “Carry Me Blow”.